It was 242 years ago today when the Continental Congress first took the critical action needed to try to balance out the enormous naval power of the British empire. It had to do it. After all, the colonies were at war. The other side was perhaps the preeminent naval power of the world. And the colonies had no navy. So what exactly did it do? And it was perfectly legal under international law at the time. By the beginning of 1776, fewer than 10 warships were actually in the service of the rebelling colonies…2 and the British navy was enormous. Something had to be done. The British couldn’t be allowed to bottle up all American shipping, and the Americans needed supplies, especially gunpowder, from foreign sources. So… are there records? You betcha. Many of the records relating to American privateers are held by the National Archives, and exist only in textual format.15 Only a few of the actual letters of marque can be found. These roughly 1100 pages of prize documents include great details on the sailors of these privateers. 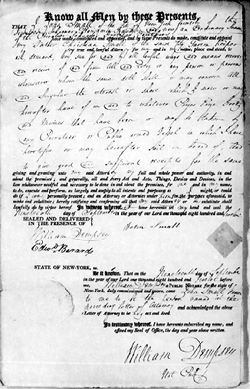 Just as one example: on 19 September 1812, John Small “of the City of New York formerly of the Privateer Schooner Benjamin Franklin and now an Ordinary Seaman of the Privateer Schooner Gov Tompkins” gave his power of attorney to his “father Christian Small of the said City Tavern Keeper.” Or the 17 January 1811 paper signed by Francis Adams, son of Francis Adams of Castine, Hancock County, Maine, as a minor over the age of 14 selecting Robert McFarland of Portland, a housewright in the County of Cumberland, as his guardian. The records range from depositions of witnesses, including full names, where they come from and, sometimes, relationships to others involved; records of courts martial; muster rolls; licenses for ships in British ports; receipts for payments to the widows, orphans and disabled seamen’s funds in England; even personal correspondence of British soldiers seized on board prize vessels. All because, starting 242 years ago today, a bunch of rebels had to hire a navy. And we today have the records to prove it. Reading this I kept thinking of one of my favorite movies “1776”. Not too factual but the spirit of what happened was there. “Saltpeter, John”. Loved the exchanges between Abigail and John Adams. Wish it could have been real. What a remarkable time and remarkable people! So many stories. I might have had a relative who was on one of the privateer ships in the Revolutionary War. I’ve gone in circles looking for those letters and google can’t find them anywhere. The only place I didn’t look was fold 3 because I don’t have a subscription there. You should be able to check the indexes on Fold3. You need to pay to see the results. Have heard that some of the Connecticut records may be in the collections of Yale University. Connecticut had an official state navy, apparently run out of a shipbuilder’s office in New London. (See: “Connecticut’s Naval Office at New London During the War of the Anerican Revolution,” by Ernest E. Rogers, based on records in the collections of the New London County Historical Society as of 1933). Interesting that 90-odd years later the US government thought that privateers in the service of the Confederate rebels were pirates subject to hanging. Which is the same thing everyone else thought about British privateers. An ancestor of mine, John Haddock, was first mate on a privateer in the French & Indian War out of North Carolina. Any records would not be in NARA. For the record, the French & Indian War predates the Revolution. The conflict, from 1754-1763, was between Britain and France. Surviving records of service from that time period would likely be in the National Archives, but the National Archives of the UK, not the US. Admiralty Courts in England are not the easiest records to access and use. They are an interesting source of genealogy records near the time of the American Revolution. I found one reference to a prize ship in a 1760s entry in Savannah Georgia court. Thanks for this! My ancestor was at the Battle of Machias (now Maine). 1st Naval Battle, see p. 126. I was thrilled to discover an ancestor who used his ship to supply George Washington’s HQ at Newburgh, NY.